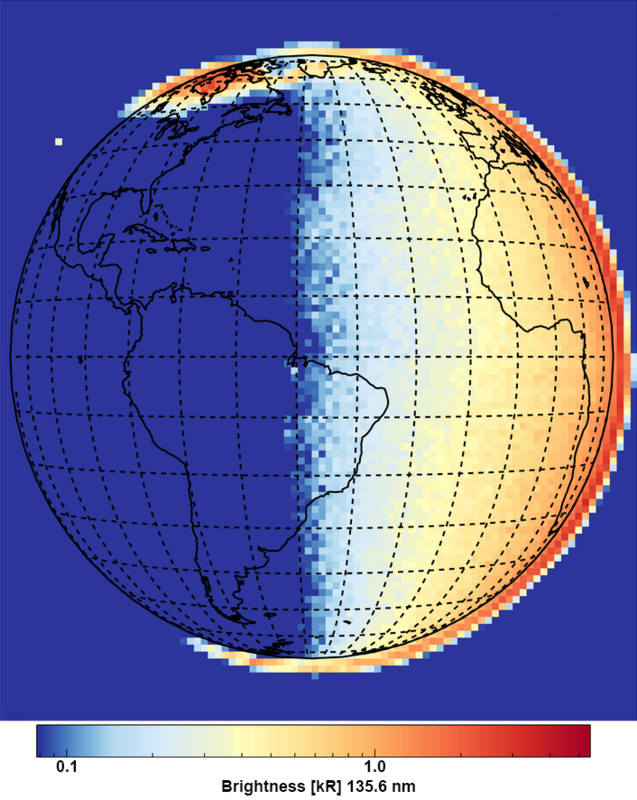 NASA’s Global-scale Observations of the Limb and Disk,or GOLD, instrument powered on and opened its cover to scan the Earth for the first time, resulting in a “first light” image of the Western Hemisphere in the ultraviolet. GOLD will provide unprecedented global-scale imaging of the temperature and composition at the dynamic boundary between Earth’s atmosphere and space. The instrument was launched from Kourou, French Guiana, on Jan. 25, 2018, onboard the SES-14 satellite and reached geostationary orbit in June 2018. After checkout of the satellite and communications payload, GOLD commissioning—the period during which the instrument performance is assessed—began on Sept. 4. Team scientists conducted one day of observations on Sept. 11, during instrument checkout, enabling them to produce GOLD’s “first light” image shown here. Commissioning will run through early October, as the team continues to prepare the instrument for its planned two-year science mission.